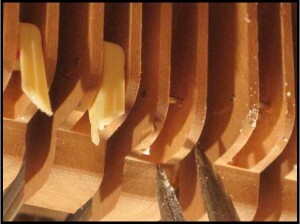 Many spinet pianos manufactured during the 1950’s and ’60’s were outfitted with plastic parts which after decades of use are beginning to weaken and break. One of the most common of plastic parts to fail is what’s known as an elbow an integral part of a number of models of spinets. The elbows in your piano are beginning to break, rendering a note useless each time it happens. I would suggest that you consider having me professionally install a complete set of highquality Vagias SnapOn Drop Lifter Elbows to fix the problem once and for all. 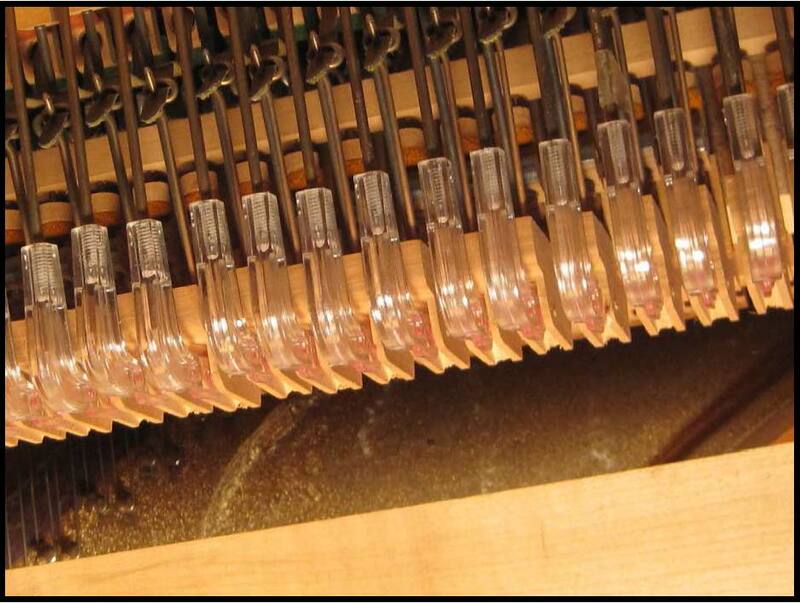 A completed installation of Vagias SnapOn elbows in a spinet piano. Why are elbows beginning to break now, after all these years? 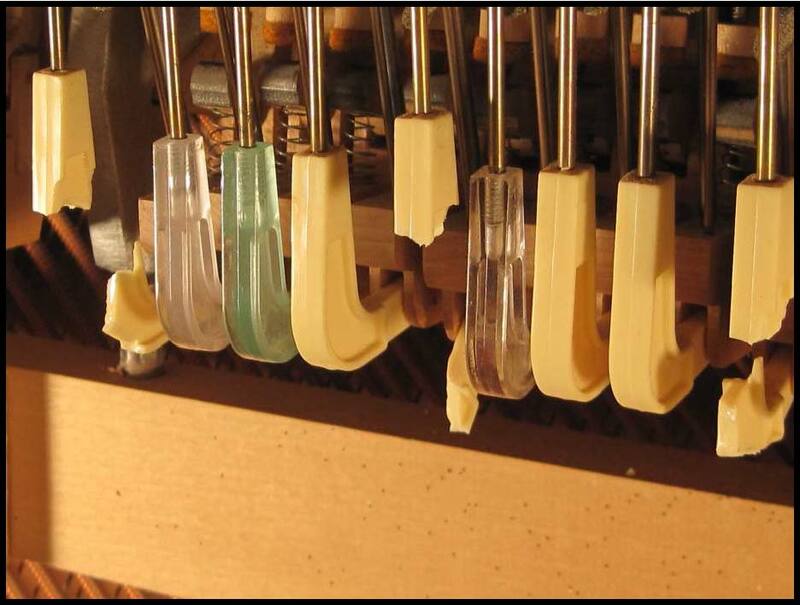 When your piano was manufactured, plastic parts were just beginning to find their way into many smaller pianos. The benefit of longterm observation of the durability of plastics was not yet available, and certain characteristics of the plastic formulations being used at the time would not be realized for years to come. A specific problem that would become apparent over time was that the chemical which was put into the mixture of the plastic to solidify the part would eventually harden the plastic to the point of brittleness. Elbows are subjected to continuous stress every time the piano is played. Breakage begins to occur when a set of elbows have turned brittle with age. Why should I replace the entire set, when only a few elbows are broken? Of course you may have me just replace the broken ones for now if that works best with your budget. The problem is that more elbows will undoubtedly break, usually at inopportune times, resulting in either yet another service call or in having to put up with notes which don’t work until your next scheduled tuning. This halfhearted approach is in fact sometimes taken, as shown in the above photo. Three broken elbows here need to be replaced (along with six more not visible in from this camera angle). In between the broken elbows may be seen three replacement elbows, which were replaced on three separate occasions. Thus, the owner of this piano had to put up with broken notes time and time again, until she finally decided that enough was enough, and the repair was done correctly. To draw a comparison, imagine you purchased an automobile with a set of bald tires. One tire blows out and must be replaced. Would it be wise to replace the other three tires at the same time? Certainly it would, because the other three would be near the end of their useful life as well. Whether the remaining bald tires would fail or not would not be the question, only when. The original elbows which still remain on your piano will continue to break if they are not replaced. Only by the installation of a new set of elbows may the problem be fixed on a permanent basis (the nylon formulation used in the Vagias elbows is made to retain some flexibility and not become brittle with age). How are the old elbows removed from the piano? 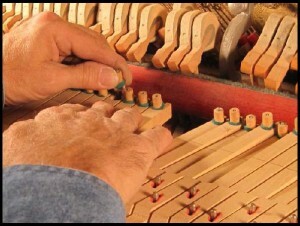 The first step is to intentionally break each elbow off close to the wooden wippen, the part in the lower area of the piano action which the elbow connects to. 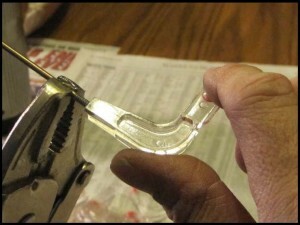 The old elbows were connected to the wippen with a brass pin, which the new SnapOn elbows will be also connected to. Before that may be done, however, the remaining portion of the old elbow must be carefully broken away and removed from the wippen. This is a delicate step and one that calls for an experienced hand. If too much pressure is applied in breaking away the remnants of the old elbows, the thin wooden wings on either side of the slot in the wippen may be easily broken. If this happens, it greatly compounds the amount of work which needs to be done. 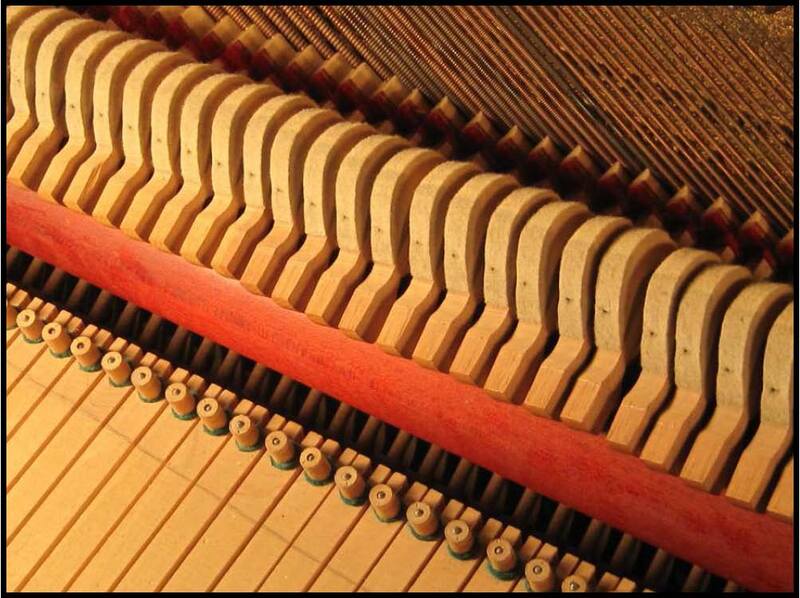 Fixing broken wippens is a more serious problem, often requiring the removal of the action from the piano. Is this a repair which I might be able to do myself? It would not be advisable, in that an inexperienced person would likely cause more problems that would need to be fixed by a knowledgable technician. There is, however, one easy related repair that you should be able to fix on your own. At times a note that is dropped down in front is not the result of a broken elbow at all, but is simply an unattached wooden button at the back of the key. To check, open the lid of the piano, pull the key cover forward a bit, and look to see if any buttons have come loose, as shown. Fix by returning the button back into place in the recessed slot. Push down firmly. How are the new elbows installed? wires, the new SnapOn elbows are individually screwed onto the threa ded lifter wires to an exact depth. The lifter wires with the new elbows attached are then reinstalled in the piano. Working from underneath the keybed, the buttons are positioned in the slot at the back of the keys, and the new elbows are firmly snapped into place on the brass center pins of the wippens. Are there additional adjustments to be made? Yes. 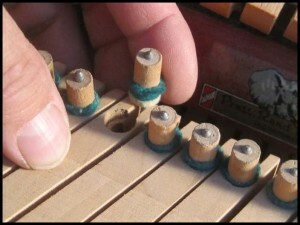 Once the lifter wires with attached elbows have been installed, adjustments will need be made to the amount of ‘lost motion’ that each note is given to prevent hammers from either bubbling (striking the strings more than once) or from blocking up against the springs (hitting the strings before being released). Are there other repair jobs which should be done at the same time as an elbow replacement job? Oftentimes, the need for this particular job comes at a time when other routine maintenance work could be done to benefit either the touch or the sound of the instrument. High on the list of work to consider for many such pianos would be hammer shaping (or replacement), voicing, and the regulation of the action. playing your instrument for years to come. With new elbows installed, and regulating buttons adjusted, all hammers are ready to fire.